Norman M. Wereley, the Techno-Sciences Professor of Aerospace Engineering and Associate Chair of the Dept. of Aerospace Engineering, was honored on November 4, 2010, with the American Institute of Aeronautics and Astronautics (AIAA) Sustained Service Award. The Sustained Service Award is presented to members of AIAA who show continuing dedication and who contribute sustained, significant service to the institute. Dr. Wereley was honored for his ?sustained service to, and leadership in, the AIAA Adaptive Structures Technical Committee, as a member, as Technical Chair and General Chair of its Adaptive Structures Conference, and for technical publications.? Dr. Wereley received his B.Eng. ?82 from McGill University, and M.S. ?87 and Ph.D.?90 in Aeronautics and Astronautics from MIT. Dr. Wereley serves as the Director of the Smart Structures Laboratory and the Composites Research Laboratory. He also serves as the Director of the Aerospace Honors Program. Dr. Wereley has published over 130 journal articles, 8 book chapter contributions, and over 200 conference articles. He is a co-inventor on 5 patents and over a dozen patents pending. Dr. Wereley serves as Editor (2007-present) of Journal of Intelligent Material Systems and Structures. He serves as associate editor for Smart Materials and Structures and AIAA Journal. Recently, he served as Student Symposium Chair for the AIAA Structures, Structural Dynamics and Materials Conference (2009). He is serving as Co-Chair (2010/11) and Chair (2012/13) of the SPIE Smart Structures/NDE Symposium, as well as Technical (2010) and General Chair (2011) of the AIAA Adaptive Structures Conference. 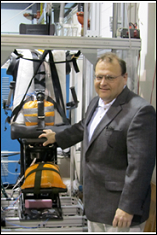 Dr. Wereley is a Fellow (2008) of the American Society of Mechanical Engineers (ASME), Fellow (2001) of the Institute of Physics Associate Fellow of AIAA, and a lifetime member of the American Helicopter Society. Dr. Wereley was awarded the ASME Adaptive Structures and Adaptive Materials Best Paper Award (2004), named the AIAA National Capital Section Engineer of the Year (2009), and honored with the A. James Clark School of Engineering Faculty Service Award (2010).